He recalled this memory while sitting over a plate of ginger chicken at Sabieng on Mission Street, his favorite Santa Cruz Thai restaurant. where the chancellor was.” That was 2006, when his years as the top administrator at UC Santa Cruz stretched out before him. Now that time is coming to an end. After what will have been 13 years in UC Santa Cruz’s top administrative job, he is retiring and stepping down from his post this spring. Blumenthal may be retiring, but he has no plans to stop working. He intends to teach a few courses for distinguished astrophysics professor Enrico Ramirez-Ruiz. He has also committed to writing the fourth edition of his book Understanding Our Universe, and remaining on the board overseeing the Keck Observatory. 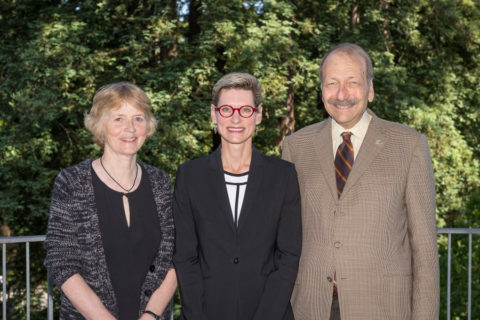 But his days as the top administrator at UC Santa Cruz are drawing to a close. “I just felt that the end was getting near,” he said, and there seemed to be no point in waiting for a “clear signal” to step down. No particular event was going to force his hand, he said. “Maybe I could get involved in a scandal that would force me out?” deadpanned Blumenthal, whose soft-spoken, polite image belies a feisty streak and an insurgent sense of humor. 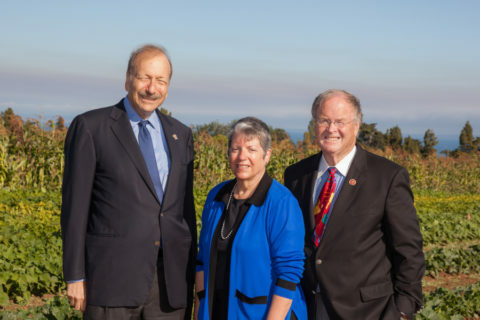 Blumenthal, UC Santa Cruz’s 10th chancellor, is entitled to change things up. He’s worked at UC Santa Cruz since 1972, starting as a faculty member in astronomy and Astrophysics. He has also served the university on a systemwide level as chair of the UC Academic Senate and faculty representative to the UC Board of Regents. Certain distinguished scientists on campus can point to Blumenthal as a close collaborator as well as a champion of the sciences. Because of his key role in so many of the papers they have written together, Sandra Faber, University Professor of Astronomy at UC Santa Cruz, considers him “co-recipient” of her National Medal of Science, which President Barack Obama presented her in 2013. Blumenthal attended the ceremony. Blumenthal did not aspire to leadership when he arrived at UC Santa Cruz 46 years ago. 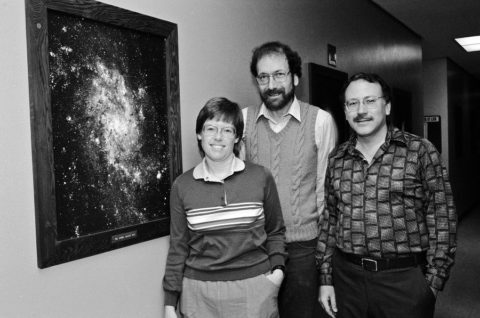 At the time he started exploring leadership roles, he’d already made his mark, helping to develop the theory of cold dark matter in the 1980s with Primack and Faber, and for his influential work on, among other things, the consequences of the background radiation that arose in the Big Bang. “But I wanted more challenges,” he said. Two decades into his time on campus, Blumenthal became active in UC Santa Cruz’s Academic Senate, and went on to chair its Privilege and Tenure Committee, and later, the Santa Cruz division of the Senate. He had to get tough or else. “Senate meetings were becoming acrimonious,” he said. To stop participants from raising endless points of order, derailing the proceedings, Blumenthal forced himself to read Robert’s Rules of Order, a book that outlines points of procedure for meetings. That seriousness of purpose— the unwillingness to let someone else do all the work and hand him an executive summary—speaks to his effectiveness and integrity, Tromp said. Blumenthal’s changing career path also forced him to reconsider his style of clothing, which was more in keeping with Jimmy Buffett concerts than administrative meetings. He bought his first suit at his wife Kelly Weisberg’s insistence when she got a job as a law professor at UC Hastings College of the Law. 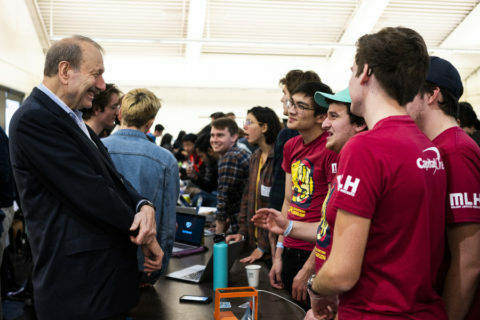 Blumenthal regards his time as Academic Senate chair and a faculty representative to the UC Regents as “some of the most exciting and interesting years of my life,” but happily returned to the classroom after 34 years of those duties. He taught until 2006, when a shocking phone call changed the course of his life. 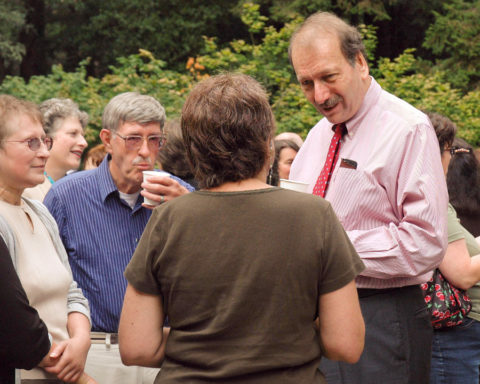 That summer, when Blumenthal was touring East Coast colleges with his daughter, then–Campus Provost/ Executive Vice Chancellor David Kliger called him to let him know that Chancellor Denice Denton, a respected engineer, had killed herself. She was 46. At the time, she had been facing public scrutiny and unwelcome press coverage for, among other things, a publicly funded and expensive renovation of her campus residence. When Kliger called Blumenthal, “he kind of knocked me out of the chair I was sitting in, then said he had recommended that I be appointed acting chancellor, which kind of astonished me,” Blumenthal said. Blumenthal, still reeling from the news of the tragedy, then fielded a series of surreal phone calls from administrators who seemed to be courting him for the top job, but were also cross-examining and testing him. Soon afterward, Blumenthal got the job offer. Upon accepting his new role, he took pains to come across as the chancellor of normalcy in the wake of Denton’s suicide. Blumenthal felt a new weight of responsibility. As he adjusted to the job, Blumenthal became much better at a skill that had eluded him in the past: learning not to dwell on some emotionally troubling aspect of a previous meeting. Blumenthal was appointed to the permanent chancellor position in 2007. 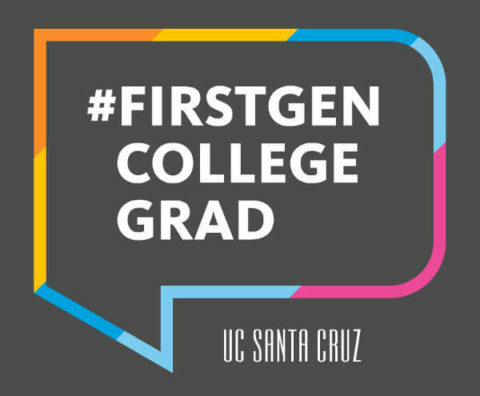 Since then, he was able to push forward some high-profile items on his professional agenda, including UC Santa Cruz’s first comprehensive campaign, which raised more than $335 million with help from 60,000 donors. He also worked to increase diversity on campus, with more support for first generation college students. Under his leadership, the number of undergraduates from underrepresented minority groups has nearly doubled over the past decade. The percentage of entering frosh who are first-generation college students—the first in their families to seek a four-year degree— now regularly tops 40 percent. Meanwhile, his early goal—better town-gown relations—came closer to reality during his time as chancellor, starting in 2008 with a signed agreement with the city and county of Santa Cruz, as well as with neighborhood groups, resolving long-standing litigation over water, housing, and traffic issues. He is also proud of UC Santa Cruz’s new Coastal Science Campus, as well as the growth of undergraduate and graduate programs and the dramatic increase in research funding, along with a boost in the campus’s academic reputation. 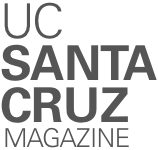 This past year UC Santa Cruz ranked third in the world for research impact, grouped with MIT, Stanford, and Berkeley. Blumenthal headed the campus during a growth period. Over the past decade, the student population went from roughly 15,000 students to more than 18,000. Blumenthal remembered true highlights such as going to the White House with Sandra Faber when she received the National Medal of Science in 2013. Other highlights are graduations. He also remembered a meeting with students that stands alongside his very worst campus memories. Blumenthal wishes certain issues would be more settled by the time he leaves office, including Student Housing West, a proposal to create 3,072 new beds at two sites on the UC Santa Cruz main campus, one along Heller Drive, the other along Hagar Drive. The project includes 140 new housing units for students with families, as well as an expanded child-care center that will serve the children of faculty, staff, and students. The children of students are currently the only children eligible for care. While the new chancellor will oversee a campus with outstanding faculty—including a wave of new academic hires, and with the highest diversity of any faculty in the UC system—the next leader will also face several pressing issues. Blumenthal considered sticking around long enough for UC Santa Cruz’s Long Range Development Plan to go before the UC Regents— something that is not expected to happen until 2020 at the earliest. General state support for higher education has been declining for years. In a few months, Blumenthal will no longer be able to set the course for UC Santa Cruz. But he hopes to make the most of his remaining time. When that time is up, Blumenthal will have to keep his own schedule, something that could also require an adjustment. He likes to joke that his personal assistant oversees his every waking moment. To honor and thank Chancellor Blumenthal for his years of service and significant achievements, a group of friends and admirers have set up the George R. Blumenthal Fund and invite all who want to donate in his honor. The fund will support the Chancellor’s Undergraduate Internship Program (CUIP), a program the chancellor is very passionate about. Visit http://bit.ly/Give2Undergrad to contribute.